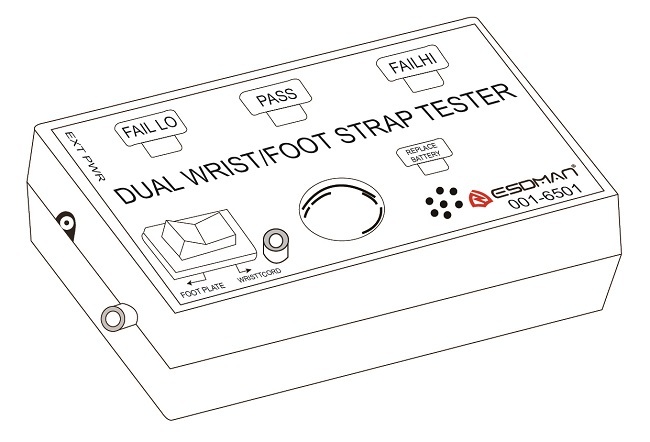 Wrist Strap and Footwear Tester ESDMAN 001-6501 Being developed as per ISO/CD8782-I standard, this tester is used to test ground resistance from hands and feet of operator. There are LED indicator and audio alarm, which are necessary for static controlling center. Supplying voltage is as low as 9V, which is very safe, and also with under-voltage protection. Moreover, it can be adjusted freely. Being developed as per ISO/CD8782-I standard, this tester is used to test ground resistance from hands and feet of operator. There are LED indicator and audio alarm, which are necessary for static controlling center. Supplying voltage is as low as 9V, which is very safe, and also with under-voltage protection. Moreover, it can be adjusted freely. 1. 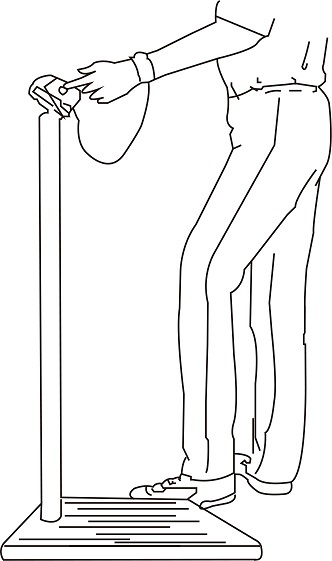 Check if the grounded apparatus is in good status or not easily and quickly. 2. Testing operation is simple and visual. 3. 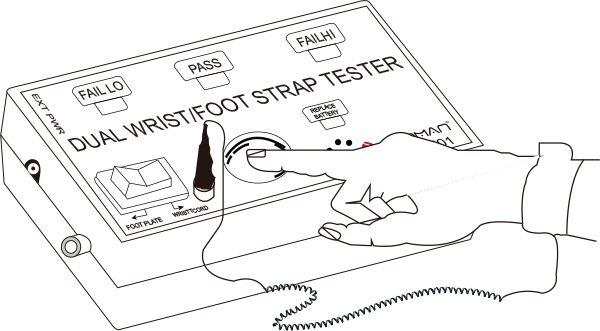 Test anti-static shoes/heel strap and anti-static wrist wrap. 1. Place the base of testing rack on the floor, then, turn the lower part of testing rack in clockwise to install it on the base. 2. Vertically insert the module with tray into the lower part of testing rack. 3. Open the battery cover of gauge head, and put battery in. 4. Install gauge head on the tray of testing rack. Push selection switch button to the left “FOOT PLATE”, then, stand on the testing plate after wearing anti-static shoes. 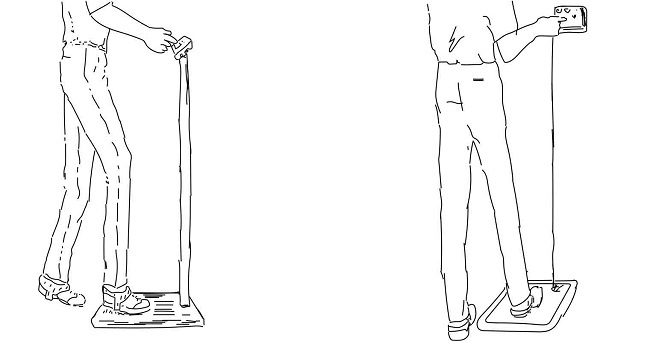 Press the metal button, and judge the quality of anti-static work shoes by the light status. While green light (PASS) is on, it indicates anti-static work shoes work normally; while red light (FAIL LO) is on, it indicates the impedance of anti-static work shoes is too low; while the red light (FAIL HI) is on, it indicates the impedance of anti-static work shoes is too high. Push selection switch button to the right “WRIST”, then, wear the wrist strap and insert plug or battery clip into wall outlet. Pressing the metal button, and judge the quality of wrist strap by the light status. 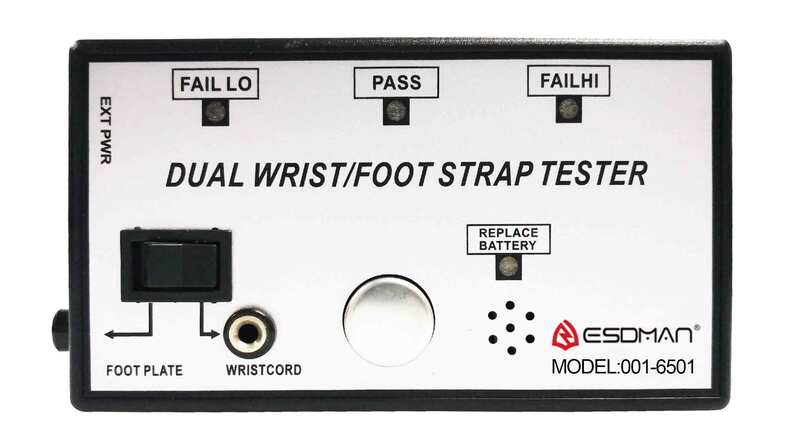 While green light (PASS) is on, it indicates wrist strap works normally; while red light (FAIL LO) is on, it indicates the impedance of wrist strap is too low; while the red light (FAIL HI) is on, it indicates the impedance of wrist strap is too high.